DARIEN, Ga. – The heat was on in the small coastal town of Darien, Ga. as 29 teams competed in the second event of the Inshore Fishing Association’s (IFA’s) Pro Division Tour held July 8-9, 2005. Anglers Bo Johnson and Mike Delduca took first place with a two-day total weight of 14.31 pounds. 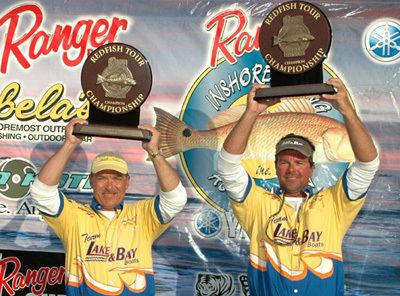 Johnson and Delduca took home a 2005 Ranger 191 Cayman, Yamaha Outboard, Ranger Trail Trailer, Minn-Kota Trolling Motor, and Humminbird Electronics. Second place went to the team of Stewart Easton and Jamie Reyneirson with a four-fish total weight of 13.74 pounds. They took home $4,500 for their efforts. The third place team consisted of Mike Friday and Danny Latham and weighed in with 12.88 pounds. They split $3,500. Cash prizes were awarded to 10th place. Mat Haag and Richard Freund, who took Big Fish (and second place) in the Pro Tour season opener event held April 8-9, 2005, in Titusville, Fla., almost did it again with a dandy weighing 4.69 pounds. However, they were just beat out by Captain Phil Rizzo’s team when alternate J.R. McGovern and Jules Rouch came up with a 4.99 pound whopper. The team received $500 for their big catch. Also noteworthy are the efforts of anglers Richie Lott and Mike Evans, who crossed over from the IFA’s Open Tour Division. While Lott and partner Ricky Raleigh won the Georgia Open Division held June 10-11, 2005 in Brunswick, Ga., Lott and new partner Vikkie Raleigh struggled with the heat and rain during this Pro Division event. Mike Evans and partner Carl Evans had a respectable showing in 11th place. Special thanks go out to Fred Stregles Jr., Executive Director of the McIntosh County Chamber of Commerce and Development Authority for hosting a great event. Charles Getsinger and The Hilton Head Boating Center were also noteworthy contributors to the event with their loan and display of Ranger boats for the tournament. IFA sponsors include Ranger Boats, Yamaha Outboards, Cabela’s, Minn Kota, Humminbird, Careco Multimedia, Image Graphics, Loadmaster Trailers, Power Pole, Salt Water Assassin, Rip Tide Lures, Thermacell, and Old Bay Side. Touted as the premier U.S. Redfish tournament organization, the IFA conducts over forty fishing events in seven states. The tournament structure is a series of two-day, catch and release, close-to-home, inshore saltwater events for two-angler teams using artificial lures. There are three different series: the Pro Tour, which is the highest competitive level; the Lure Tour, which is competitive and a possible launch pad into the pros for aspiring anglers; and the Open Series for those who just enjoy the fun, sport, and camaraderie of fishing. In accordance to IFA’s mission, the goals of competition, recognition, and education are the center of their focus. IFA is dedicated to providing an avenue for the talented anglers of the Redfish Tour to excel in the world of competitive professional fishing.